PlayFusion, the developer and publisher of the MR trading card game Lightseekers will be making its long-awaited debut onto PC and MacBook. Building on the smash success of the game on Nintendo Switch, the Heroes of Tantos are making their way onto Steam in Q1 of 2019. The best part is that the game will support cross-play with mobile devices, the Nintendo Switch and now with Steam, so there’s a wealth of adventures to be had from day one. Over 750,000 players have jumped into the vibrant world of Tantos, and new adventures are always emerging for those veteran Lightseekers and budding heroes alike. With new card releases, campaigns and digital content carefully being carefully crafted for the game regularly, it’s the perfect time for brand new players to jump straight into the action. By merging the realm of the physical and digital trading card game, players can experience a whole new connected experience. 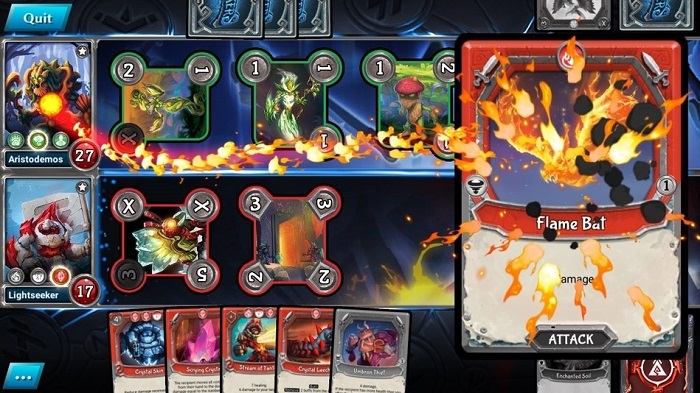 By scanning cards from physical collections, players can then immediately begin to customise digital decks with brand new cards, forge new tactics and battle the best Lightseekers worldwide on the digital battlefield. Practice with custom decks against AI or play casually against the community or friends! The easy-to-learn mechanics of the game will quickly have players thinking of devastating combos and counters in no time. Once players have refined their skills, they can show their prowess in ranked matches to earn great treasure, unlock huge rewards and challenge the leaderboards for their rightful place amongst the Lightseekers elite. With the new expansion the brand targets the new players to join the exciting world of Tantos. Adventurers can play the game with physical cards available in stores as well as digitally on mobile devices, Nintendo Switch and soon on Steam as a free download. Now is the time to see what journeys await in Lightseekers.